Connecting with Compassion: Confessions of two Child Life Specialists: FACLP 2018- What's in Your Tool Box? FACLP 2018- What's in Your Tool Box? I love networking with people of like minds. This year's FACLP theme was "What's in your Tool Box?" My first thought was... "Well that doesn't really apply to me anymore, does it?" But as always, conference has a way of putting things into perspective for me. My Tool Box is my Tool Box. Not yours. It's mine. I can have what I need in it to be the best I can be at whatever I might set out to accomplish. As is the case with many things in this world, it is easy to fall into the trap of comparison. It's easy for me to quickly assume that as a CCLS, my tool box should contain things such as "5 years working in Children's Hospital of ABC" or "Extensive experience in the ICU setting working with XYC population." But as in other areas of life, my tool box looks different... and it's about time I own it with pride. It's time for me to start giving back to the child life community with my unique skill set instead of being ashamed of my tool box. working in a non-profit with children and families separated by the state due to a varieties of reasons such as abuse, neglect, etc. I am a Child Life Specialist. No, I don't work in a hospital. I might never work in a hospital again. Or maybe I will? Who's to say where my tool box might take me next? But what I do know for sure- My tool box is my tool box, and no one can take it from me. 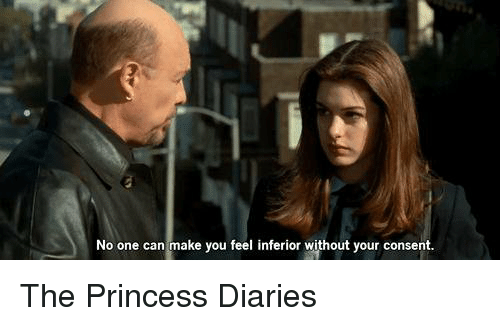 Remember that iconic quote from The Princess Diaries? So why do we give others the power to make us feel like our tool box is inferior to theirs? It's your tool box! Own it! So what's in your tool box? How different is yours than mine? Where has your child life journey taken you?